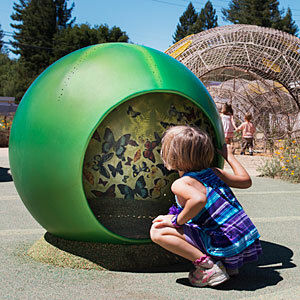 At the Children’s Museum of Sonoma County, little ones drop toy fish into a stream, then dash to the river’s end to catch them in tiny nets. There are also tires for fort building, bubble stations, and a see-through painter’s wall. Exhibit signage offers nuggets of science, but the real point here is to let kids (the sweet spot is ages 3 to 8) mess around and investigate.